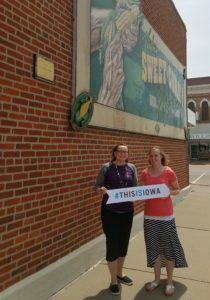 Melissa Schwan, VU Director is pictured with Jessica O’Riley, Tourism Communications Manager for Travel Iowa, a division of the Iowa Economic Development Authority. Vinton, Iowa (May 10, 2017) — In honor of National Travel and Tourism Week, the Iowa Tourism Office recognized Vinton Unlimited recently for contributing to the state’s $8.06 billion tourism industry. National Travel and Tourism Week (May 7-13), now in its 34th year, unites communities across the country to celebrate what travel means to employment, economic growth and personal well-being. “We know we are just a small piece of the tourism puzzle here in Vinton but we are always excited for visitors to come experience Vinton. Our tourism committee has been working hard over the past 2 years to really boost our offerings and our presence with tour groups,” said Melissa Schwan, Director of Vinton Unlimited. Travel is an integral part of the state’s economy because people who visit Iowa annually generate more than $450 million in state tax revenue that pays for programs that benefit residents. The industry also supports the jobs of more than 67,000 Iowans – jobs that can never be outsourced to another location. In addition to its benefits for the local economy, travel can also have a positive effect on personal well-being for residents of and visitors to Iowa. Numerous research studies have confirmed the positive health effects of travel and time off, from reducing the risk of heart disease to decreasing depression. Using time off to travel with family is good for everyone, especially our children—kids who travel with their families are more likely to attend college and earn more as adults.